No full-service tunnel car wash system is complete without an automated drying system. 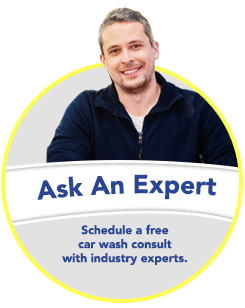 Though many car washes offer drying as an up-sell, the number of customers who select this option can be as high as 90%. Paying anywhere from an additional $2-$5, these customers want to ensure that they’re not driving away with a spotty, half-dried vehicle. Traditional forced air drying systems blow off most of the moisture following a car wash. Typically, these systems leave behind about 20% of the surface water on the vehicle. This moisture can either be dealt with by a detailer, wiped down by the customer, or dry or slide off as the customer drives away from the car wash.
Motor City Wash Works Dry N’ Shine mechanical drying system offers a superior drying service at the end of a full-service tunnel. Following a 50 HP forced air drying system, the Dry N’ Shine wheels remove that extra moisture left behind. In our basic model, a horizontal top wheel composed of super absorbent materials wick away the wetness from cars, SUVs and trucks while a tire dressing applicator dries the vehicle’s wheels. Take a step up and add two vertical side wheels for a full dry. For high volume car washes, dual, alternating wheel systems are available to ensure that car after car gets the same dry finish all day long. The process takes about one minute, the same as most air-powered drying systems. The Dry N’ Shine, as demonstrated in this video at Images Auto Spa, doesn’t even leave behind enough water to soak a paper towel. Wondering whether the wheels ever get water logged? A spin-dry cycle can be programmed to run between cars, but even without this maintenance cycle, our systems can easily handle a steady of stream of vehicles all day long and still produce the same dry finish. While most full-service tunnel wash systems will run 30-50 vehicles per hour, our Dry N’ Shine systems are engineered to handle anywhere from 100-200 vehicles per hour without compromising drying quality. Centrifugal force is used along the length of the wheel to push water to the outside diameter, flinging it off and away from the vehicle. After initial installation, running a wash mode twice a week during off hours to clean the absorbent wheels can keep the Dry N’ Shine system running smoothly for years. Along with this, the applicator brushes on our tire dressing system typically last over 200,000 vehicle applications. The system reduces the manpower needed to run your car wash. Full-service car washes using the Dry N’ Shine no longer need detailers hauling and scaling ladders to dry off the roofs of trucks and SUVs or detailers with chamois wiping down tires. Instead, an employee merely returns the dried vehicle and its keys to the customer. “We installed the Dry N’ Shine to replace an existing Shammy Shiner, looking to remove the water droplets that were left on the vehicle after our blower. Since installing it, we offer it on our $20 wash or a la carte for $3 and have 35% of our customers using the Dry N’ Shine. If you’re eager to improve the finishing quality in your tunnel system but worried about the cost of installation, we’ve crunched the numbers for you on our product page. For our single top wheel, two side wheels and tire dressing applicator system, your return on investment begins after 12,550 car washes. Take a look at the videos and data on our Dry N’ Shine page to learn more or contact us at 866-362-6377. Discover 10 ways to increase your net profits. 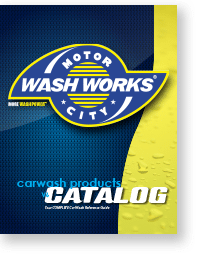 Motor City Wash Works, Inc.